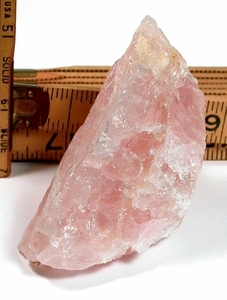 Here is a cheerful bright blush pink rose quartz rough from South Dakota. Called 'cabinet size', it's a beauty of 1-7/8x 1-3/4x 3-1/4", naturally styled to sit in your hand. Little rainbows, some chatoyance, and tiny freckles of iron oxide to mark an area of regrowth already. Keep from sun to preserve its' delightful color.